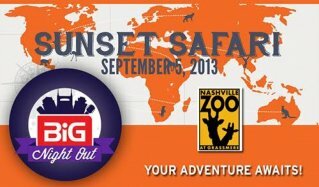 We are giving away 2 main event tickets for Sunset Safari 2013! Explore the pathways of Nashville Zoo to uncover culinary treasures and exotic beverages. Journey down under to Kangaroo Kickabout, Nashville Zoo’s newest animal habitat, featuring a troupe of kangaroos ready to welcome you into their garden. Music, entertainment and animals representing the four corners of the globe abound! Don’t miss this one-of-a-kind event – your adventure awaits! Cocktail dresses, animal prints and safari wear set the stage for Sunset Safari’s distinctive style. Registering to win is easy. Just visit Big Visual Group on Facebook and click on the red #BIG Night Out tab. You have until midnight on Tuesday, September 3rd to register. A winner will be chosen at random and announced on Wednesday.